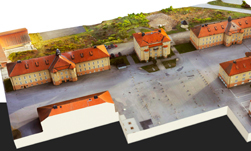 Spotscale, a Swedish startup, uses machine learning to transform standard aerial images into realistic 3D models. The company, a member of NVIDIA’s Inception Program, attended the annual Computer Vision and Pattern Recognition conference in Salt Lake City, Utah this week and we caught up with them to learn more about their technology. The company uses NVIDIA Tesla V100 GPUs on the Microsoft Azure cloud, along with multiple cuDNN-accelerated deep learning frameworks to train their convolutional neural networks. “This really powers the speed of how we do things,” Emgard explained. Emgard told us that because of deep learning, his company can classify objects much faster. “Traditional computer vision methods were not good enough. Now we can classify what is a tree, what is a wall, what is water and it’s so much easier with machine learning,” the CEO said. The company’s demo at CVPR shows off the startup’s building reconstruction technology in virtual reality, which allows users to inspect buildings in fine detail in a fully immersive environment. To power the demo the team used an NVIDIA GeForce GTX 1080 Ti GPU. Right now the company can reconstruct building, neighborhoods, and cities with standard aerial imagery. Customers can upload their own data, or they can hire the company to do it for them.